Secretary of Agriculture Ed Schafer spoke this morning at the Tufts Friedman School of Nutrition Science and Policy. Students and faculty asked questions on issues ranging from biofuel production to nutrition policy. 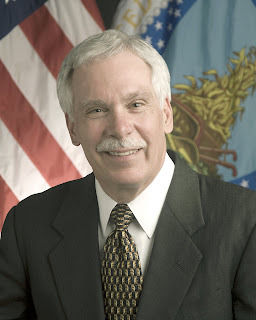 Schafer, the former Governor of North Dakota, has clearly made biotechnology, and agriculture research more broadly, one of his priorities. Much of his talk was devoted to putting his goals for U.S. policy in the context of the recent trends in global food prices-- the increased consumption and demand for meat in developing nations, diminishing grain stocks, and other "grim news broadcast in the headlines today." These current conditions let the Secretary outline his beliefs that increasing yields will be the most important future goal for countries around the world in order to meet growing demand. In this vein, Schafer expressed his hope that every country in the world will be able to use genetic modification to increase their yields. He seemed dismayed at the "problem of some countries worrying about" genetic modification of their food supply and pronounced that it is "time to not allow political and social issues to run the show" in lieu of science. "Focusing only on risks and not benefits is the riskiest" said Schafer. One interesting question about the difference in policy needed to address global food shortages and obesity in the U.S. led Secretary Schafer to mention his visit to a food bank earlier that morning where he was able to "go and touch hungry people." He indicated that both the Food Stamp Program and school lunch programs are working to provide healthier food. He recognized the problem of availability of fresh, healthy food faced by many urban residents--a problem for which he admitted he does not yet have a solution. In addition to a lengthy discussion and several questions about government incentives for biofuel production and the shift from corn-based ethanol to cellulosic, the Secretary highlighted the "new" dietary pyramid and efforts to place it on packaged food labels. Other questions fielded by the Secretary were about rotation of lands out of the Conservation Reserve Program and the implications for animal health and resource utilization of Confined Animal Feeding Operations. Overall, Secretary Schafer presented a broad picture of the scope of USDA policy without any particularly surprising perspectives. Although the remarks were billed as being about the farm bill and food safety, he had little news on the preliminary Farm Bill deal reached among Congressional leadership last Friday. It is expected that a final deal will be reached in 1-2 weeks, precluding the need for an extension of the 2002 Farm Bill. If you attended today's talks, please feel free to share your observations. What are you calling a food desert? Does a healthy local food environment require a major brand-name supermarket? Does a neighborhood without such a supermarket automatically deserve to be called a "food desert"? I considered these questions on a long walk here in Boston from my office south of Chinatown through the South End to a meeting in Roxbury last week. 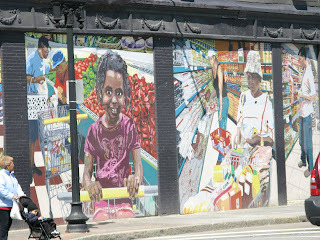 The store with the mural reminded me of the local markets I loved growing up in DC. Often Hispanic-owned, they were heavily used by White and African American neighborhood residents also. 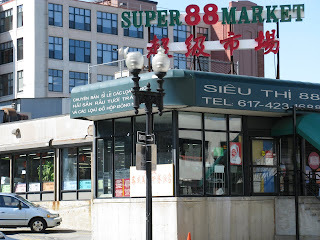 The Super 88 Markets here are Asian American owned, but they also market effectively to Haitian and Caribbean immigrant communities. 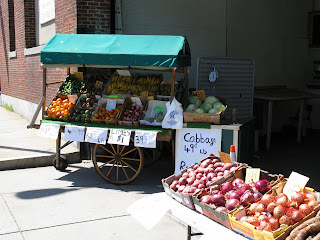 If a neighborhood can be a "food desert" then this vegetable stall (below) on a back street can be a "food oasis." A graduate student once asked me for advice on a study he was doing of the supermarket desert in the Northeast Kingdom region of Vermont. I think of the fresh fish and vegetables I bought last Fall at a farmers' market in St. Johnsbury and cooked for old friends who had gathered to go biking in the hilly woods near there. If this part of the country is a supermarket desert, does that mean the remedy is necessarily a supermarket? It sometimes seems to outrage my students when I ask if the retail environment for low-income communities in the United States is so bad and whether larger stores would improve it. I don't know the answer to my own question. But I do distrust assessments that seem to stack the deck in favor of finding a "desert" by defining too narrowly what type of large retail qualifies as adequate. This week, I spoke with Mark Winne, former director of the Hartford Food System and author of the recent book, Closing the Food Gap: Resetting the Table in the Land of Plenty. The book stands out for its integration of environmental and anti-poverty themes. Mark speaks plainly about tough lessons learned. He describes the growth of the emergency food system in stark terms. Similarly, he tells of working on a non-profit food cooperative in inner-city Hartford that failed, while later public-private partnerships to recruit for-profit supermarkets thrived. He ends by discussing the growth of food policy councils, including a recent proposal to establish a Massachusetts Food Policy Council. WIC messages: "Touching Hearts, Touching Minds"
Instead of lecturing low-income mothers about nutrition science, the Touching Hearts, Touching Minds site from the Massachusetts WIC program takes an emotion-based approach towards healthy living education for pregnant women and mothers of infants and young children. In addition to providing nice posters and teaching materials for free, the WIC site offers much to think about on topics frequently covered on U.S. Food Policy. If you have been weighing the money and time costs of home cooking for a low-income single parent, you may be interested in some of the site's recipe materials as examples that show the possibilities and limits. If you have been contemplating food industry marketing that implicitly encourages early weaning from breastfeeding, you may like the site's materials for mothers of infants. This poster about "pester power" and food advertising is also interesting. While millions of hungry Americans besiege food banks and food pantries across the country with requests for emergency assistance, the U.S. Department of Agriculture (USDA) returned $81 million in fiscal year 2007 funds to the Treasury that could have been spent to purchase bonus commodities, according to a recent report from the Congressional Research Service (CRS). The money in question was allocated to Section 32, a permanent appropriation that since 1935 has earmarked the equivalent of 30 percent of annual customs receipts to support agriculture activities and the farm sector, including child nutrition and emergency food programs. By statute, Section 32 funds are to be used only for: (1) encouraging the export of farm products through producer payments or other means; (2) encouraging the domestic consumption of farm products by diverting surpluses from normal channels or increasing their use by low-income groups; and (3) reestablishing farmers’ purchasing power. Under the second purpose, USDA’s Agricultural Marketing Service (AMS) purchases surplus commodities – everything from grapefruit juice to bison meat – for domestic food assistance programs, such as the School Lunch Program, The Emergency Food Assistance Program (TEFAP), and the Commodity Supplemental Food Program (CSFP). These surplus or “bonus” buys have been a mainstay of emergency food providers nationwide for the last decade, although declining supplies in the past four or five years have significantly reduced government foodstuffs provided to the poor. Instead, USDA policy under President Bush seems to be favoring the third purpose of the law – reestablishing farmers’ purchasing power. Section 32 has been used in recent years for disaster initiatives and other purposes, such as compensating livestock owners for animals lost in the droughts of 2001-2002, helping Florida citrus growers replace trees lost in hurricanes and freezes, and supporting AMS administrative expenses for direct food purchasing, including the establishment of a new computer system. AMS officials told Foodlinks America that the agency has considerable discretion under Section 32 and is under no obligation to spend the funds just because they are available. They noted that any bonus purchases must be economically and legislatively justified and approved by the Secretary of the Department. Nonetheless, with USDA proactively implementing initiatives such as bartering excess commodities (see Foodlinks America of September 14, 2007 and March 14, 2008) in order to try to pump more product into the emergency food system, it is curious that available funds went unused. State commodity distribution agencies were concerned and perplexed by USDA’s failure to utilize all available funds to address growing hunger needs. “Our EFOs [Emergency Feeding Organizations] have seen on average a 20 to 40 percent increase in demand mainly due to high energy costs this winter,” said Randy Mraz, emergency food assistance director for the Maine Department of Agriculture, Food and Rural Resources. “Our food supply is at a five-year low. It is unfortunate that the USDA chose not to use available funds to bolster the supplies for the emergency feeding networks,” he added. CRS reports are not always posted to the internet. If somebody notices a link to this one, please mention it in the comments, and I'll add the link to this post. Michigan food stamps twice monthly? If Michigan Gov. Jennifer Granholm signs a state bill as expected, Food Stamp Program participants will begin receiving their benefits in two monthly installments. This policy reform is the latest in a series of steps that make food stamp participation more similar to and consistent with working. The Food Stamp Program was once closely tied to cash assistance, but it has been improved in recent years to make it more accessible also to low-income working families who are not quite poor enough for cash welfare payments. The program was once delivered in special coupons or "stamps", which carried a high-level of stigma, but the benefits are now distributed through electronic updates to debit cards like any other bank card in the grocery score checkout aisle. Finally, the program has always credited the benefits only once monthly like a welfare or social security payment, but the Michigan proposal for twice monthly credits would be more similar to the schedule for direct deposit of a working person's wage or salary. We pointed out last November that the Michigan proposal may be preempted by the federal government, because the farm bill that passed the Senate would forbid states from pursuing this type of policy innovation. Some people suspect that USDA's Food and Nutrition Service was behind the farm bill language, but a colleague at FNS tells me he doesn't believe that is correct. The Michigan proposal would apply only to households who receive more than $100 in food stamp benefits monthly. Households that receive smaller benefit amounts would still receive their benefits just once per month. According to the Associated Press, the Michigan Department of Human Services neither opposed nor endorsed the proposal, but it did request a survey to collect input from food stamp participants themselves. Thirty-five percent of participants thought twice monthly delivery was a good idea, and 59% thought it was not. The Michigan grocery lobby, which supports the twice monthly delivery in part because it could reduce checkout-line inconveniences, pointed out that the survey might have been more informative if it were tabulated separately for participants with more or less than $100 in benefits per month. It seems likely that the people with larger benefits, who would be the only ones affected by the proposed change, would be the same ones most likely to support the change. Even though the advance survey doesn't settle the question, asking the participants themselves is the right attitude. Even beyond this advance survey, the twice-monthly policy should be assessed to see if it causes participants any shopping inconvenience and to see if it delivers the expected benefits. These benefits could include lower risk of food insecurity at the end of the month and perhaps higher purchases of perishables such as milk and fresh fruits and vegetables. A final point I always emphasize on this issue: the twice-monthly benefit delivery is not more paternalistic than the current policy. Twice-monthly benefit delivery does not constrain shopping schedules any more than once-monthly delivery does. If you receive your benefits once monthly, but you prefer to do major grocery shopping more than once monthly (as most non-participant families do), you could undertake the mild inconvenience of saving half your benefits for use later in the food stamp month. Conversely, if you receive your benefits twice monthly, but you prefer to do major grocery shopping only once monthly (as some participant families currently do), you could undertake the mild inconvenience of waiting to conduct the big shopping trip until the second payment is credited. You'd only have to wait one time ever. After that, you could shop once monthly as you always did. Will global food prices keep us healthy? Nothing makes a geeky food policy student like me more excited than seeing the NYTimes writing about cross-price elasticities of demand, except that they didn't actually use the technical term for it. The cross price elasticity of demand, or the change in demand for one food when the price of another changes, is a formula for calculating the response consumers will have to changing food prices. For example, suppose the price of corn syrup goes up 1 percent, so people buy less corn syrup and more of other stuff-- the cross-price elasticity for fruit would show the percentage increase in fruit spending in response to the higher corn syrup price. In light of the recent surge in global prices of food, especially grains and meat, Wednesday's NYTimes article is about the light that some healthy and local food advocates see at the end of the global food "crisis" tunnel. So their theory goes: If the price of products produced with large quantities of corn, like corn syrup and grain-fed meat increase drastically--which is already beginning to happen--then people will switch to eating more fruits and vegetables and more locally grown food that doesn't require as much fossil fuel to transport it to the grocery store. While this phenomenon may be true for some, it may take more than rising prices for consumers to change their behavior. One of the factors affecting this response is the degree to which food A, fruit for example--is a complement or a substitute for food B, corn syrup in this example. One can use cross elasticities to show how much the price of corn syrup would have to go up in order for consumers to "demand" more fruit. Of course the response also depends on how much prices continue to rise, whether fruit and vegetable prices continue to rise less than those of other foods, and if farmers change their production decisions for the coming year. But I wonder if substitution to healthier or more sustainable foods will actually happen on a large scale, or if we, and our food companies, will just figure out shortcuts to our favorite processed flavors. We also should remember what a small percentage the price of corn represents in the price of corn flakes- in other words, most of the cost of processed foods is for value-added in production, marketing and distribution, not the raw ingredients themselves. And on a related topic, is HFCS "natural"? A Food and Drug Administration (FDA) official sent the corn refiners lobby into a tizzy today, by stating the obvious. High-fructose corn syrup (HFCS), whatever merits or demerits it may have, should not be marketed as "natural." "The use of synthetic fixing agents in the enzyme preparation, which is then used to produce HFCS, would not be consistent with our (…) policy regarding the use of the term 'natural'," said Geraldine June. "Moreover, the corn starch hydrolysate, which is the substrate used in the production of HFCS, may be obtained through the use of safe and suitable acids or enzymes. Depending on the type of acid(s) used to obtain the corn starch hydrolysate, this substrate itself may not fit within the description of 'natural' and, therefore, HCFS produced from such corn starch hydrolysate would not qualify for a 'natural' labeling term," she concluded. A comment today by a single Food & Drug Administration employee regarding whether High Fructose Corn Syrup (HFCS) is “natural” was mistakenly portrayed by an online news outlet as the official position of the agency, but actually reflects only the personal view of that one employee who was responding to a reporter’s question. Last year, under pressure from possible consumer group lawsuits, Cadbury Schweppes agreed not to use the term "all natural" in advertising 7-UP, a carbonated beverage made with HFCS. The Accidental Hedonist has been covering HFCS periodically. Corn syrup technology advanced significantly with the introduction of enzyme-hydrolyzed products. In 1921, crystalline dextrose hydrate was introduced. Then in the mid-1950's, the technology for commercially preparing low conversion products such as maltodextrin and low DE syrups was developed. The purification and crystallization of dextrose meant for the first time that corn based sweeteners could compete in some markets that had been the sole domain of the sugar industry. The next developments involved enzyme catalyzed isomerization of dextrose to fructose. The first commercial shipment of high fructose corn syrup (HFCS) took place in 1967. The fructose content of the syrup was around 15 percent. Further research enabled the industry to develop a higher conversion and the first commercial shipment of HFCS-42 or 42 percent fructose syrup took place a year later. Further refinements in the process were developed in the late 1970's and by the mid 1980's, HFCS became the sweetener of choice for the soft drink industry in the U.S. This corn refiners association's history makes the industry's scientists look like clever folks, but it's off message for the industry's "natural" claim. It seems unwise for the corn refiners association to let this debate turn on the question of whether HFCS is "natural." The association should give ground on that point, the better to win other victories another day. If they give up on marketing HFCS "produced from such corn starch hydrolysate" as "natural," there are more honest adjectives that the corn refiners might use to praise their product: "sweet" and "inexpensive." Er, ... "formerly inexpensive."